We set out to Mahabalipuram, from Chennai, with a lot of skepticism about touts and pesky beggars and vendors. But Kart and I were determined to visit another ‘World Heritage Site’ and squeezed in this quick trip. The drive was excellent with the beach on one side and back­wa­ters on the other. If lucky one can even spot Porsches and Ferraris on this road. The toll road was probably one of the best roads in the south and the many shades of blue of the sea water were very inviting. We reached there in good time and headed straight for the Shore temple. The entry fee for all the protected monuments is a paltry Rs 10. We were surprised to find landscaped lawns, clean surroundings and organized shops inside the premises. The name Mahabalipuram evolved from Mamallapuram, named after the great Pallava ruler Mamalla (c.630-68). It lies 58 kilometers from Chennai, and the monuments here dating back to the 7th and 8th centuries are protected under UNESCO’s World Heritage Sites. The temples here show the movement from rock-cut architecture to structural building. The Shore temple, our first stop, speaks of the grandeur of the Pallavas and has weathered the forces of nature for centuries. 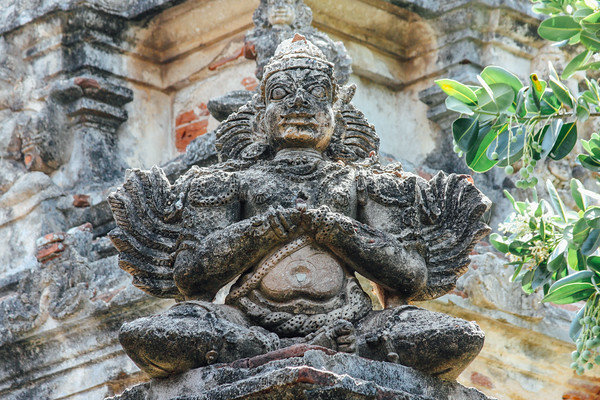 This is one of the first ever structures to have the gopuram architecture. This is truly the beginning of the concept of structural architecture. Buildings became more than one story dwellings. Then we headed to the Five rathas which were carved out of a single rock. Each ratha has its own architectural style and exudes grandeur and splendor. The structures are named after the Pancha Pandavas and their common wife Draupadi, of epic Mahabharata fame. In order of their size, they include the Dharmaraja Ratha, Bhima Ratha, Arjuna Ratha, Nakula Sahadeva Ratha, and Draupadi Ratha. Since these were never consecrated because they were never completed following the death of Narasimhavarman I, they are not technically temples. The Architecture Society of India (ASI), instead, prefers the term vimanas. Our next halt was the old light house where one can still see a chamber where logs were burnt to signal to the ships. The view from the top is breathtaking and offers a 360 degree view of the coastline and monuments. Around the light house one can see the numerous caves each depicting a mythological story. Prominent among these are Krishna Mandapam, The Varaha Cave, Dhar­ma­raja Cave and the Mahisasmardini Cave. Another must see, is the Descent of the Ganges or Bagiratha’s Penance – a giant open-air rock relief. Set out early to beat the heat. Carry water and sun protection. Even in February it can get oppressive. As the sun rose above, we had to don our coolers and caps. One can spend from a few hours to a few days learning about the architecture and stories behind the sculptures and whichever it is you decide to do, do not miss Mahabalipuram. Kanchipuram is one of the holiest cities in India, and is only 72 km from Chennai in Tamil Nadu. It is a city with more than 1000 temples, is sacred to both the Saivites and Vaishnavites. Kanchipuram and was a city of learning for both Tamil and Sanskrit. It was during the reign of Pallava dynasty, from the 4th to the 9th centuries that Kanchipuram attained its limelight. The city served as the Pallava capital, and many of the known temples were built during their reign. Kalidasa a Sanskrit poet who lived around 4th-5th century extolled the virtues of the city in one of his verses. What began in Mahabalipuram became the normal, new way, of construction, here in Kancheepuram. Together the two cities are a must for anyone studying architecture. Kanchipuram today is also the center for the Kanchi Mutt, a religious institution that became influential and famous under the leadership of Shri Chandrashekarendra Saraswati. Apart from its temples, this small town is also known for its thriving hand loom industry. The main profession of the people living in and around is weaving silk sarees, more than 5,000 families are engaged in this industry. The silk weavers of Kanchi settled more than 400 years ago and have given it an enviable reputation as the producer of the best silk sarees in the country. Woven from pure mulberry silk the sarees have an enviable reputation for texture, lustre, durability and finish. Kailasnatha temple is an early structural Shiva temple built of sandstone in Kanchipuram, India, by a Pallava dynasty king Narasimhavarman II also known as Rajasimha in the early 8th century. It is decorated with Yallis or fierce monsters. The stone gets very hot in the sun so make sure you visit this architectural wonder in the early morning. It is protected by the ASI. The temple is a natural progression to the Mahabalipuram rathas and one can see the architecture develop over the centuries. Kamakshi Amman temple is one of the main temples in the city and dedicated to goddess Kamakshi, the Goddess of love. It is one of the three Shakti peetams along with Madurai and Kashi. All the other temples in Kanchipuram do not face East but actually face this temple. Also in this city with so many temples it is strange that there are no other temples with a shrine for Goddess Durga. This temple is tied very closely to Adi Sankaracharya and a lot of the festivals here are begun with his blessings. Foreigners are not allowed into the inner sanctum of the temple as with all the temples in Kanchipuram. Varadaraja Perumal temple is an ancient temple built by the Cholas in 1053 and one of the 108 divyadesams the holy abodes of Vishnu. It is located in part of Kanchipuram called the Vishnu Kanchi that is a home for a lot of famous Vishnu temples and one of the greatest Hindu scholars, Ramnujacharya is believed to have resided in this temple. The temple itself is on top of Hastigiri hill, which is believed to be Indra’s elephant Airavata. There is a hall of 100 pillars and the sculptures on each pillar is stunning. Stories and legends from Hindu mythology are depicted. Hire a guide and he will show you pillars that emit different sounds, one in particular that when the stone is tapped in different places sounds like gold, silver or copper. Once in everyone’s lifetime, 40 years, the holy tank, Anantha theertham is emptied and a wooden idol of Lord Attigiri Varadaraja is taken out from under and worshipped by millions. The next festival will be in 2019. Ekambareswara temple is one of the Pancha Bhutha Sthalas (five elements) and is the Earth form. According to legend, Goddess Parvati, once playfully closed Lord Shiva’s eyes and plunged the world into darkness. Shiva, angry cursed Parvati and she turned black like Kali. She then came here to earth and did penance under a mango tree that still exists. Like the Kamakshi temple, ancient shrines existed in these locations prior to 600 AD but the current construction was built by the Pallavas and the Cholas. The temple covers an area of over 40 acres. Reaching a height of 57 meters, the temple’s Raja gopuram is one of the tallest in South India and was built by the Vijayanagar King, Krishnadevaraya. Along the way from Chennai to Kanchipuram, lies Sriperumbedur, where Rajiv Gandhi, was killed by female LTTE suicide bomber Thenmuli Rajaratnam known as Dhanu on May 21, 1991. Today there is a memorial in his honor. While both can’t be covered in a day, use Chennai as a base and explore these architectural and religious wonders of South India.